Here on the north eastern part of the Queen Charlotte Islands lies the Naikoon Provincial Park encompassing 72,640 hectares of Graham Island. The Queen Charlotte Islands consist of more than 150 islands, 50 to 130 kilometres west of British Columbia's mainland. The islands are often referred to as "the Misty Islands" because of the often overcast and foggy skies. Most of the parks forest cover is made up of stunted lodgepole pine, red and yellow cedar that surround the low boglands of the area. On the well drained higher regions grows a lush forest of western hemlock and sitka spruce. The wildlife of the Naikoon Provincial Park area are a mix of introduced and native species including the abundant black tail deer, racoons, red squirrels and beavers as well as herds of wild cattle left over from the domestic stocks of early settlements. Dolphins, porpoises, hair seals and California Grey whales can be spotted in the off-shore waters. The birdlife is abundant and similar to that of the nearby mainland. The rivers and streams within the park are home to a wide variety of fish species. The Tlell River has large runs of coho salmon and steelhead trout. There are also cutthroat trout and Dolly Varden char in most of the streams. 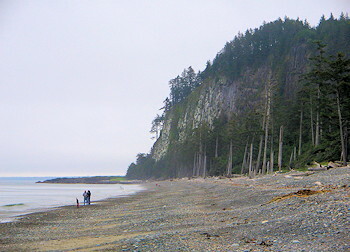 The native inhabitants of the Queen Charlotte Islands refer to the park area as "Nai-kun", referring to Rose Spit, the point of land jutting off of the northern part of the island, which was adapted to Naikoon hence the name of the park. 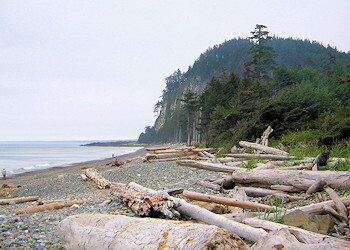 The Haida are the traditional residents of the Haida Gwaii or "Misty Islands". They are noted for their proud, bold, vigorous, and resourceful qualities as well as their fierce tribal war practice, canoeing prowess and artistry. Explorer, Juan Perez is credited as being the first European to visit the Queen Charlotte Islands. The islands are accessible by scheduled flights from Vancouver and Prince Rupert and by BC Ferries between Prince Rupert and Skigegate. Highway 16 which connects the island communities also provides access to Tlell, Mayer Lake and Masset which are the closest communities to the undeveloped interior of Naikoon Provincial Park. 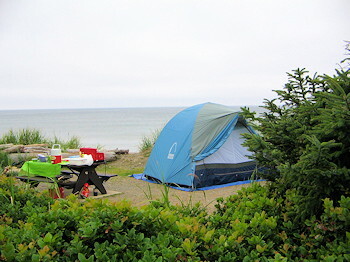 Camping - Agate Beach Campground has 43 units and is located west of Tow Hill and Misty Meadows Campground has 30 units. Toilets, water and firewood are provided at both. There is wilderness camping permitted throughout the park and three rustic shelters are provided near Cape Ball and Oceanda Rivers and at Fife Point. Fishing and Boating - A car top boat launch is located at Mayer Lake. Anglers may try their luck at Tlell River, Mayer Lake and other waterways within the park. Hiking and Trails - An extensive trail system of varying difficulty and length leads the visitor to the scenic features of Naikoon Provincial Park. Gas, accommodations and other necessary supplies are found in Sandspit, Queen Charlotte City, Tlell, Port Clements and Masset.